Mrs. Janet Lightfoot passed away Aug. 31 at the Avalon Assisted Living Center in Hillsborough. She was 80 years old. 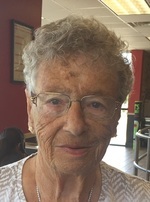 Mrs. Lightfoot was born on Long Island and lived in South Plainfield and Somerville before moving to Franklin Township in 1962. She worked at the Shoprite in Somerset and the Cedar Grove Café for many years and volunteered her time with the Cedar Grove Cemetery Association. She was pre-deceased by her first husband, Thomas Wilson in 1994, her second husband Richard Lightfoot in 2013 and a son, Dwayne Perrine in 1968. Mrs. Lightfoot is survived by her children, David Perrine of North Brunswick, Debra Reichert and her husband George of Pittstown, Donna Ghee and her husband Thomas of PA., a brother Arthur Seaman and his wife Dorothy of NC, her grandchildren Erika Laine and her husband Heikki, Todd Reichert and his wife Jessica, Laure Blyskal and her husband Thomas and Jessica Reppert and her husband Daniel and 5 great grandchildren. Visiting will be held from 2-6 p.m. September 2 at the Gleason Funeral Home, 1360 Hamilton St. All services will conclude at the funeral home on Sunday and interment will be private. Please consider a contribution in Mrs. Lighfoot’s name to the Franklin Township Animal Shelter at 475 DeMott Lane Somerset NJ 08873.